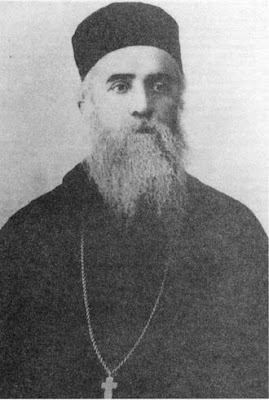 Saint Nektarios, Bishop of Pentapolis, in the year 1901 was situated in Athens, and he produced and published a text called On Exercise. This period is important, because as is known a few years prior, in 1896, the Olympic Games were held in Athens, and as might be expected it had cultivated a spirit of euphoria around athletics and many fitness clubs were founded for this purpose. Therefore, it is interesting to see the perspective of a Saint, the great Saint of our day, regarding this subject. In this way we will have a criterion by which to judge contemporary events in regards to athleticism and the Olympic Games. This text was republished by Metropolitan Makarios of Kenya and Eirenoupolis in his book Historical Annals of the Patriarchate of Alexandria and All Africa, Volume I, Nicosia 2002. At the beginning of the text Saint Nektarios presents the words of Aristotle, who says: "For both excessive and insufficient exercise destroy one's strength, and both eating and drinking too much or too little destroy health, whereas the right quantity produces, increases or preserves it." By this Aristotelian dictum it becomes obvious that Saint Nektarios is in favor of balance, because every extreme creates problems in the soul of man, while the middle way is that which saves temperance. This, of course, as we shall see below, means that Saint Nektarios accepts exercise and the athleticism of the body, provided on the condition that it is balanced. Saint Nektarios begins his analysis of the subject on the basis of this Aristotelian passage, which he calls a "wise saying", considering measured physical exercise to be considered by all as the true character of every perfect education. He writes: "Measured physical exercise has been considered by all for centuries in every civilized nation as a necessary undertaking and integral to follow, and a companion of every free and well-behaved citizen, and the true character of perfect education." He then proceeds to substantiate this view, with the important argument that there is a close association between the soul and the body and therefore an interaction between these two aspects of man. Everything that happens to the human body responds to the one person, and the same thing happens with the mental world of man. When the body suffers, man says "I'm suffering". The same, of course, is with the passions of the soul "of the one person." Thus, both aspects get sick and both are healthy in the interaction of one with the other. So "man must think ahead for the aid of both." The conclusion to this point, according to Saint Nektarios, is that "the exercise and fitness of the body and spirit, as everyone knows, have the same inherent duties, levied under the same nature and destination, because the body serves the soul willingly and tirelessly, and the soul, having developed its own powers, tempers and heals the bodily powers in a temperate manner." According to Saint Nektarios, not only does the mental health of a person help the body, but the bodily health of a person helps in the health of the soul. After this general observation, Saint Nektarios proceeds to highlight the truth that the development of both, the soul and the body, requires great care and provision so as not to bring a person to extremes. Indeed, the provision and exercise of the body must be reasonable, because excessive exercise of the body wears out the soul. In general, "the extreme to this provision will be towards the negligence of the other." He particularly insists on the damage caused by excessive exercise of the human body. Such excessive exercise damages the soul in two ways. The first is the indirect damage to the soul with sickness, and the second takes place with the excessive strength of the body, because excessive strength of the body "is unbearable and unfitting as well as insubordinate and insolent and encourages the soul towards disobedience." And because in this instance the soul is not exercised in parallel it has thus become ill, which is why such excessive exercise and athletics of the body provides "the audacity for it to rebel against the spirit and seek to subdue it and place it under its rule." These views lead Saint Nektarios to accurately record what ultimately is the purpose of fitness, or of bodily exercise. His words are clear. He writes: "Wherefore by fitness achievable athletic vigor is not sought, nor indomitable and untamable muscle strength, but the strengthening of physical power towards the ready satisfaction of the demands of the spirit and the fulfillment of its prescribed tasks; for the intended purpose of exercise is not to promote the athleticism of the sportsman, but men perfectly formed, capable of all endeavors; which is why exercise makes one most ready for the games and industrious through appropriate pains. Thus the middle path of exercise is to preserve prudence, namely the harmonious growth of the powers of the soul and body, as well as sovereignty over the body, in order to be ready to fulfill the journeys." Having determined carefully that the purpose of an athlete is to render man complete, then he points out that the work of the State, which must ensure and be interested in offering the most perfect education for young people, is to take an interest in this project also, as he writes, the present generation should accept the obligation "to complement the work of their fathers" and work towards the nation's greatness and struggle with readiness "so others would not raise up a banner in the East, namely the lot that has fallen to Greece." This purpose was carried out by the various Clubs being established. Within this framework he refers to the beneficial presence of Clubs and, of course, he means the Clubs which were founded for the purpose of exercising the body and general education and the perfection of young people. The work of Clubs, according to Saint Nektarios, is great and beneficial "because they are determined to show forth good men, who are strong and beneficial to the country. Such clubs need to have a program; they also need to seek to tread on the path on their ancestors, and appear equivalent to the virtues of their fathers, and accomplish the progression and growth of their own homeland. Clubs need to bring within them all the necessary attributes to make them stronger and achieve their purpose." Speaking of the offerings of these Clubs, he again finds the opportunity to return to emphasize the need of combining physical and mental exercise that helps to truly educate a person. He writes: "Physical exercise and spiritual growth are the two axis's that turn towards perfect formation and perfect education." The results of such a comprehensive education are great because "the developed man proves to be a prosperous man, eminent, grandiose, disposed towards great deeds, powerful, and capable of all enterprises, who is beneficial to all at all times." Thus the intellect of man is cultivated, especially the virtue of prudence, which according to Aristotle is "the symbol of the health of the soul and the mother of all virtues." Clubs and indeed fitness organizations should offer such an education to young people. This is why Saint Nektarios wrote: "The attainment of such a virtue needs to be pursued by fitness clubs, to set out for companions to continuously communicate to tighten the bonds of friendship, to join the youth in a brotherhood, to scatter petty antipathies and rivalries, to break away from vain and useless occupations, to introduce at the stage of preparation, to expound fair play, to increase in being honorable, to remove laziness, which gives birth to indifference, flabbiness, negligence and all wickedness, and prepare strong men to defend the rights of the fatherland. This should be the purpose of the clubs." When the fitness Clubs have this purpose, to train the body and soul symmetrically, then no one can object to the work being done. "How can we in the least show qualm towards such clubs which anticipate great benefit, when we see minds deliberate what is excellent, and the body effortlessly perform what is deliberated well?" However, he does not stop only at emphasizing the value of Clubs, but he goes on to support the view that the lack of such Clubs is a "testimony to incomplete development" and the deprivation of many good things. He praises Europe for understanding the value of such Clubs. "Civilized Europe counts so many fitness clubs, that their number exceeds the number of schools. And the splendid fruits they give, everyone knows." After analyzing the thoughts of Saint Nektarios, he reaches the conclusion that the State, municipal leaders and the wealthy class should support the creation of fitness Clubs on behalf of balanced human development. By presenting the thoughts of Saint Nektarios we can form the following conclusions. Saint Nektarios lived at a time when there was euphoria for the creation of fitness Clubs, after the Olympic Games which took place in Athens in 1896, for the development of fitness and physical athletics. This, moreover, is to be observed at that time in Europe as well. Seeing this Saint Nektarios did not refuse it, nor condemn it negatively, but he made positive proposals. He recognizes the necessity of physical exercise, but stresses that it should be proportionate and in any case in parallel with the exercise of the soul. For this purpose he used a passage from Aristotle, which is a comment from the Orthodox side. And what one observes from the text of Saint Nektarios, as in all his writings, is the kindness of his character as well as his interior calmness and gentleness. This shows us how we also should work in society, even in what seems to be a negative event. We need to identify the positive points in everything, then with courteous arguments try to build on how in the best way there could be beneficial effects.